We’re off again…. Packing, unpacking, repacking, they seem to have become part of our routine…. It’s our 5th consecutive weekend away travelling as a family! The jetlag is still going strong from our latest adventure in California and our heads are still filled with happy memories. Our bodies are tired but our spirits are high. 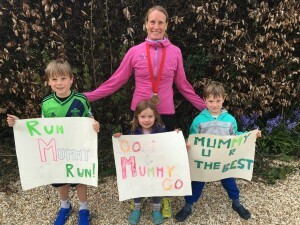 We’re all excited, especially the children, as we load the car for our next journey, a weekend in London so I can run the marathon on Sunday. Dring, dring… The morning alarm goes off on Sunday. The jetlag makes it feel early, it’s already 7am. Time for my favourite morning breakfast, a smoothie loaded with fresh fruits, oats, almond milk and almond butter! Yummmmm. I’m off to the start of the race. We’re staying in London Bridge, 15 minutes on the train from the race, but even in the lift I bump into another runner! On the street there are runners everywhere, spectators too, making their way to the train station to get to the start line in Greenwich. My concern about finding my way to the start disappears. I just follow the crowds! The gun goes off and we are free to run. I am trying to pace myself at a steady 7:35min/mile for the 26 miles for a 3h20 finish. There’s a long way to go so I resist the temptation to start off too fast. However at mile 2, I spot the 3h15 pacer. I think about it for a nano-second. The temptation is just too strong. I have to give it a shot. I need to take the risk. I simply have to try my best… After all, that’s what I’ve been training for… I know deep down its too ambitious … but … I find myself unconsciously starting to follow the pacer. So I attach myself to the group and am tracking at 7:25min/mile. It feels really comfortable. 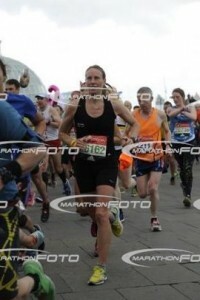 I am elated, smiling and bouncing at every stride, taking it all in and mesmerized by the wall of spectators. The plan was to see my family at mile 9, but I just can’t see them in the crowd of spectators. There is so much support, so many rows of spectators along the entire course, I just can’t see anyone clearly. Everything around me appears blurred, all my senses are overloaded. There are people shouting encouragement from all sides, music, loud speakers …. perhaps my family didn’t make the first meeting point in time. I found out late, I ran right passed them but I didn’t see them. Then the predictable happens, the pace is starting to feel too fast … I decide to ease off and drop the 3h15 pacer around mile 10. That’s one dream gone so I latch on to the next target, 3h20. 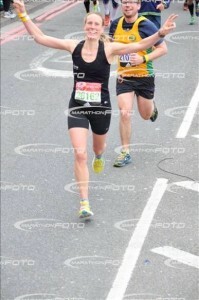 I realise I was so engrossed in the race that I forgot to take my gel at mile 8! It’s mile 11 by the time I manage it. Then soon enough it’s Tower Bridge. The wall of sound and enormous crowds mean my emotions are strong thanks to the incredible spectator support. I reach the half way point in 1h38. And the elite men appear around the corner, they look so strong, their running is absolutely amazing, they are flying! I struggle on to Canary Wharf. I am still digging deep when I see my family, my husband, our 3 beautiful children and my parents-in-law, standing in the crowd in the front row, cheering me on at mile 19. I am so happy, the inspiration comes back instantaneously, my eyes fill with tears and I start to pick up the pace. 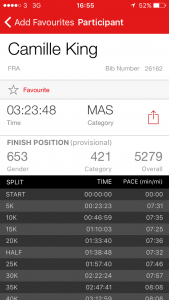 I clock a 7:20min/mile to mile 20! The best support crew ever! My mind is back in the game, even though my legs are tired. Why aren’t they accelerating as my mind is dictating? There seems to be a disconnect between my brain and my legs? I wonder if I am lacking fuel … I need to get sugar and salt in my body, and so I ingest whatever I can get my hands on (electrolyte drink, gels, water, salt tablet). My body is feeling stronger, but my legs don’t seem to be able to accelerate. I settle into a gentle pace until mile 23, when I see my family again! Nearly there, last 5km now. Another look at my watch makes me realise I am in danger of being slower than last year. Surely, after all this training, I cannot let that happen … it is simply not an option! So here I go again, I dig deeper and give it my all. My tired legs are starting to move a bit faster. 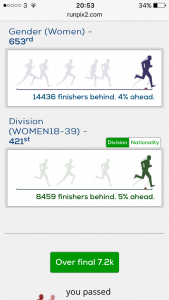 I cross the finish line in 3h23, exactly one minute faster than last year 🙂 Phew, I am happy with the outcome, a PB, just! What a race, what an experience, I am overwhelmed by emotions!